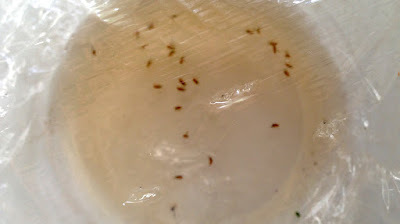 Curse of Summer's Bounty: Fruit Flies! That Weed In Your Yard? It's the New Superfood. Buying Whole Fish: Don't Be Afraid! 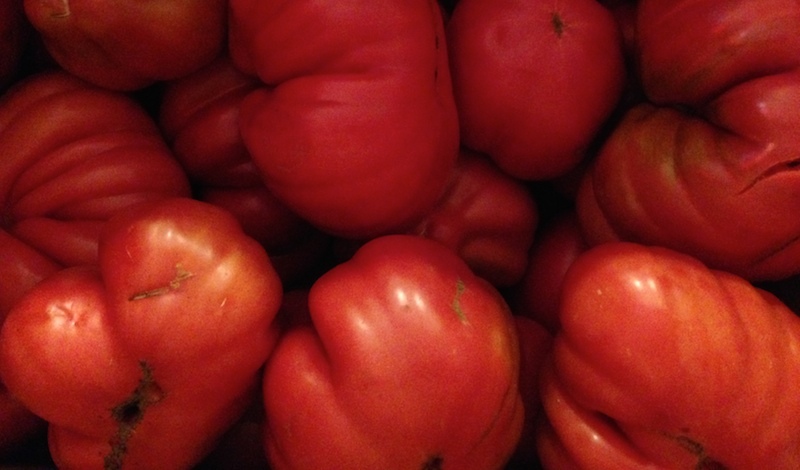 In this essay contributor Anthony Boutard of Ayers Creek Farm guides us through the process of making tomato sauce from his most excellent Astiana paste tomatoes, the descendants of an Italian variety, the seeds of which his wife, Carol, dug out of a compost pile during a trip to the Piedmont many years ago. 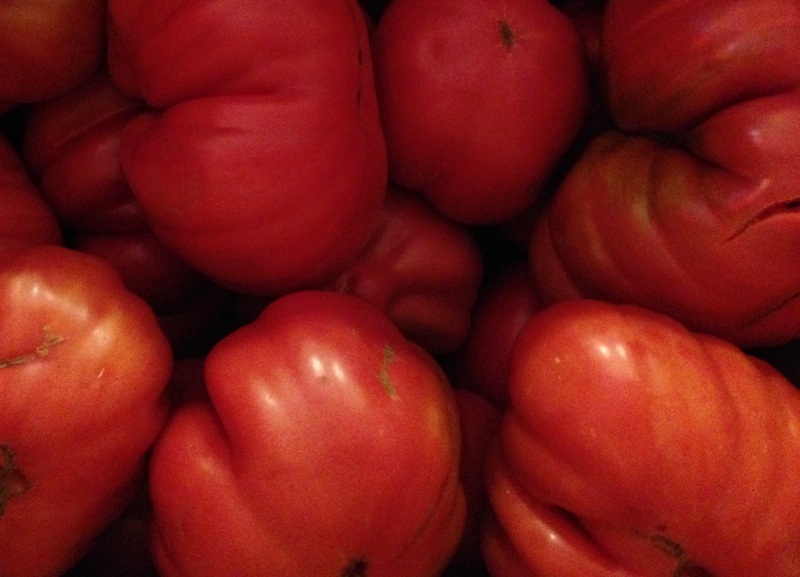 I am a devoted fan of these tomatoes, and plan to freeze about 150 lbs. of them this year using this method. Oh, and Anthony has stated that present company is excepted when he refers to certain food writers. Whew. We had several questions about making tomato sauce last week. Here are our thoughts. Despite what food writers stress, fully ripe or over-ripe fruit should be avoided for canning purposes, use these in a fresh sauce. (Another calumny of the present crop of food writers is that tomatoes instantly stop ripening when they are picked from the vine. This is absolute nonsense, foolish fussiness from people who are paid to know better but never seem to actually work with fruits, just write about them.) We find the brightest and most flavorful sauce comes from fruit on the near side of ripeness, a diversity of stages produces a more interesting sauce. Avoid the fixation on color; flavor is what counts come January. 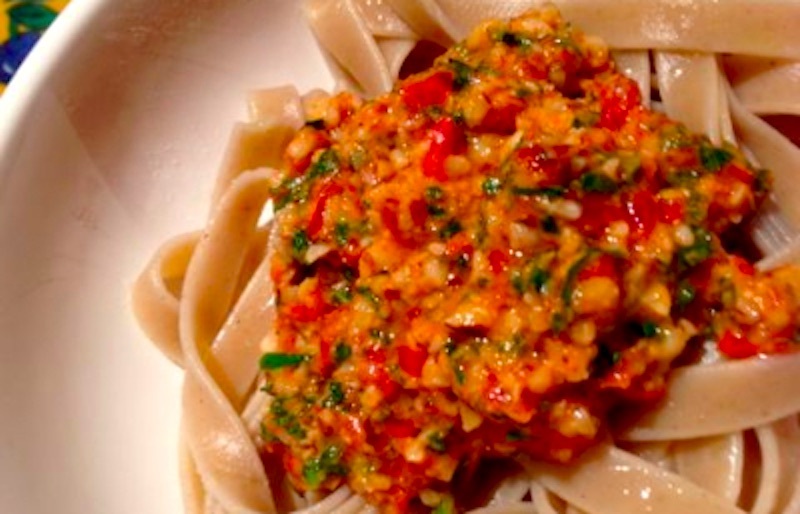 A high level of acidity assures a bright and flavorful sauce. We resist the Macbeth "boil and bubble, toil and trouble" approach to sauce making. Nothing is gained from the drama of watching and stirring the cauldron, and it leads to time wasted and an over-cooked sauce. (Akin to putting berries one-by-one, never touching, on a cookie sheet prior to putting them in the freezer when it is much easier to put the whole flat in instead.) Cooking does not concentrate the sauce, heat-facilitated evaporation does. Only at the canning stage is a higher heat briefly necessary. …tomatoes can fully ripen within a couple of days. We wipe off the whole tomatoes if needed, pierce them a few times with a knife and place them in a big oven pan. Mound them up as they will settle down as they cook, and sprinkle some salt over the top if desired, which helps preserve the color. Put the pan in a slow oven, around 200°F. You can leave them there for hours, or overnight. Periodically, we decant off the "nectar," the amber liquid that drains from the tomatoes. We put this into 1-quart canning jars as a stock for stews and soups. After the tomatoes have fully collapsed, we run them through a food mill. We also can some whole tomatoes. At this point, the sauce is medium thick, and can be be canned. We also further concentrate some sauce by returning it to the low oven for a day or so. Slowly and gently, it will evaporate and thicken. We find this gentle heat produces a far better sauce than rushing the process over the stovetop flame. Commercial sauces are often made with a vacuum cooker which concentrates the sauce quickly at a relatively low temperature in the range of 180°. Once again, a gentle process but as of yet there are no home kitchen vacuum cookers. The oven method works very well. 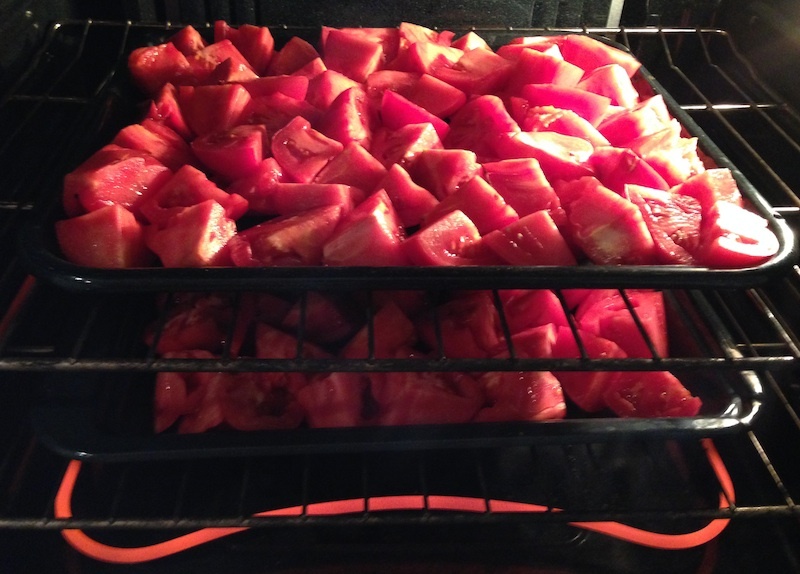 Tomatoes roasting in the oven. We pressure can because, well, we have one, and it is fast and easy. You can also process in a hot bath per standard instructions because these traditional tomatoes are acidic enough. Many people freeze the sauce instead of using a canner. Although we put up over 100 pints of tomato sauce at varying degrees of thickness, we never add anything but salt. We prefer to add seasonings later. Caution applies especially to ingredients that lower the acidity (increase the pH) like peppers. The acidic nature of tomatoes makes them safe and easy to can. Best not to mess with that comfortable margin of safety. Because Astiana is our own variety and not a precious heirloom or such, we can sell them at $35/20 pounds without shame, and you get the stylish Ayers Creek Farm lug in the bargain. We will have some tomatoes prepackaged and, with a measure of trepidation, accept requests to hold 20# lugs as supply permits. Please email us before 4 pm on Saturday, and we will try to fill requests for 20# lugs only. And don't fret if this isn't the week for you, we will have them for the next few weeks. There is something essentially human about working with your hands, especially when you are gathering food to feed your family. My friend, journalist and author Hank Shaw, has made a career out of his passion for hunting, fishing and foraging, and in this essay he reflects on the reasons he chose this path and why he believes it's good for all of us to engage in. I encourage you to click through to read the entire piece. My hands feel like they’ve been hit with a weed whacker. One finger is swollen, another scraped to hell. A burn here, a blister there. The tips are all tender, and I don’t know how many little puncture wounds I have that are in various stages of healing. 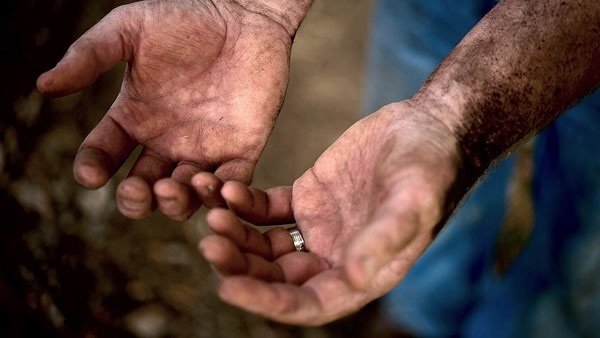 These are the hands of a gatherer, an angler, a hunter. A cook. They are my hands. This past week has been a maelstrom mashup of almost all that do in my odd little life, and my hands tell that story. A burn from a catering job. Blisters from hammering away at a rocky shoreline with a steel bulb planter, looking for littlenecks. A nasty puncture wound from a rockfish spine. Another from an errant hook. 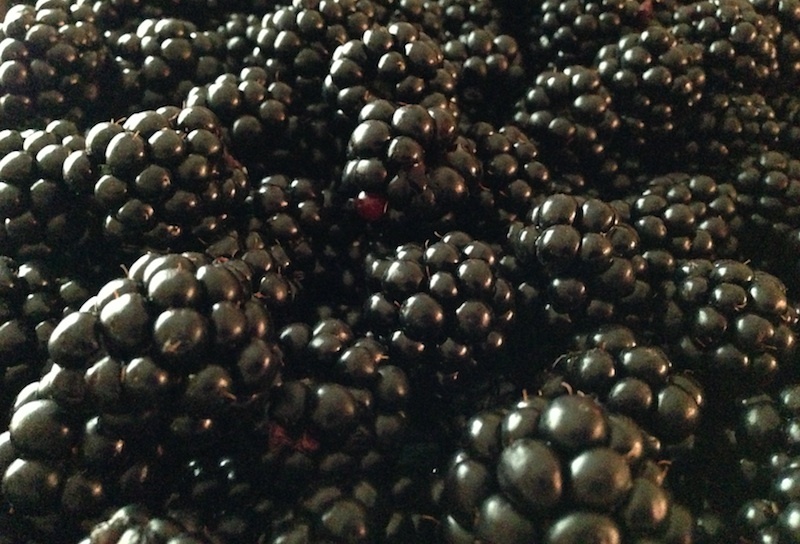 A lattice of lacerations on the back of my hands – the price of picking blackberries. And with most of my fingerprints scraped off by hours of digging forearm deep into rocky sand in search of buried horseneck clams, it’d be a great time to commit a crime. Hands, if you look closely, will often tell you how their owners put food on their table. Think of a fisherman’s calloused paws, or an artist’s delicate digits. People’s professions can be guessed at by the state of their hands. Mine are no different, only they tell this story more directly. Lord knows I need not do this. I have been a writer by trade for more than two decades. I live in a suburb, surrounded by supermarkets. Were I to forsake them, I’d still have a farmer’s market available to me almost every day of the week, and friends who raise livestock far superior to any of the sad, factory-farmed meat you see wrapped in plastic. I choose to work for my food for a variety of reasons, but it’s in no small part because, well, we are hard-wired to do so. Every animal on earth does two things above all else: Reproduce, and eat. It’s what we do. Yesterday I found myself standing above Tomales Bay, stopping to catch my breath. The hill I was climbing was steep, and I was carrying a bucket full of clams and seawater that weighed somewhere north of 35 pounds. Heart hammering against my ribs, I looked up, gasped for air — and understood why I do this: An oceanic breeze cooled my forehead, whisking away the beading sweat so it could meld itself into the mists that still hung in hollows of this coastal plain. I could smell the salt, but also the spicy perfume of a California summer, a mix dominated in this place by a native bay laurel and a seaside sagebush that I wish I could somehow wear as cologne. Read the rest of Hank's essay and find out what we have in common with animals in the zoo. Top photo by Holly Heyser. Tomatoes this year? A mixed bag. The cherry tomatoes—one Sungold and a black cherry—were prolific, as was a full-sized green variety called Aunt Ruby's. The two Purple Cherokees, on the other hand, were disappointing, both in terms of healthy plant growth and yield. 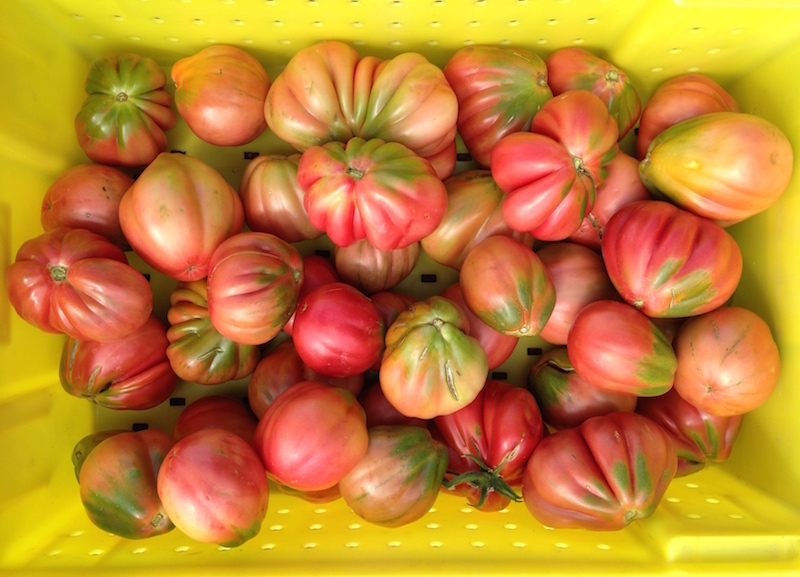 The darker tomatoes are our perennial favorites for their robust flavor and gung-ho willingness to lend a hand for slicing, as well as serving in sandwiches and tomato salads, so we'll probably opt for another variety next year. Fortunately, though, the farmers' markets and local supermarkets have given us plenty of supplemental, organic "heirloom" tomatoes—a term d'art used to describe not just old varieties, but almost any open-pollinated (i.e. non-hybrid) tomato, whether bred for commercial or private consumption. 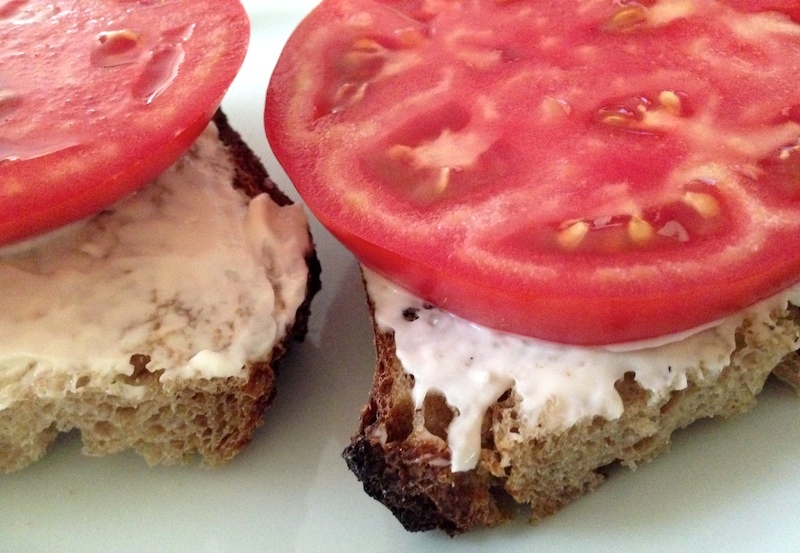 And consume them we have, from simply sliced on a platter to wedging them between two slices of Dave's homemade whole wheat bread to a snack bowl of cherry tomatoes on the kitchen island, perfect for grabbing as you pass by. 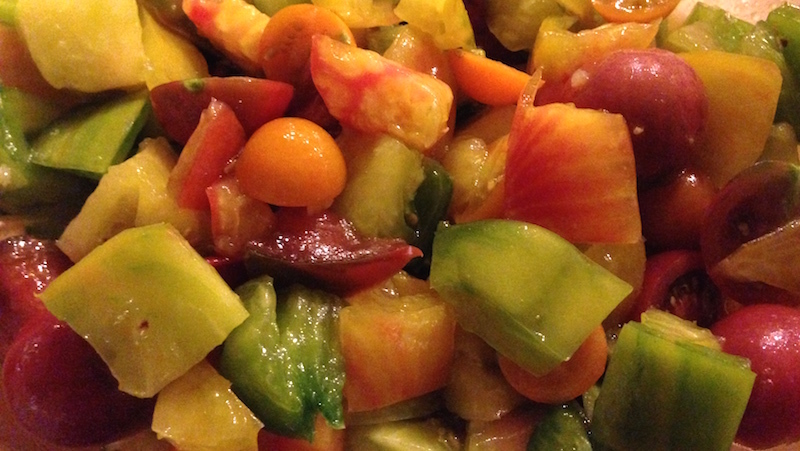 There's been cool gazpacho and panzanella, and more of those cherry tomatoes tossed in a grilled corn salad. And of course let's not forget the pasta with cherry tomatoes, garlic and anchovies that's one of our go-to quick dinners. Even after all that, there was a moment when I walked in from the garden with another gallon of cherry tomatoes—we were also watering our vacationing neighbors' tomato plants, which were producing like crazy—and I would have shed some tomato-laced tears, but I remembered a tomato jam (top photo) I made a few years ago. So if you get to that "too many tomatoes" stage and you've made all the tomato dishes you can think of, and even created a few more out of sheer desperation, here's a simple fix for the problem that you can enjoy any time this winter when the supply of the fresh article has dwindled. I grew up in a country where I was an untarnished citizen, even though my parents were immigrants. Courtesy of the 14th Amendment, the fact that I was conceived in another country and neither of my parents were citizens didn't matter a whit. I registered to vote and attended town meetings, and have never shrunk from participating in the messy business of government. Over the years, I have missed just one special election, even voting when the election involves just a handful of unopposed individuals and might be dismissed as unimportant. To the people who bother to get on the ballot the vote is always important. Today, I am what the nativists call an "anchor baby," a child born to immigrants but still entitled to citizenship. Or as some put it charmingly, a "child who was dropped in America." In fact, under the immigration rules in force back in the 1950s, my mother had to hide her pregnancy during the immigration interview or they would have been denied entry. Mother succeeded and I was born three months later, the first United States citizen in the Boutard tribe. For the last 17 years, I have had the pleasure of working with a variety of immigrants whose children were born here, and are citizens in the fullest meaning of the word. Like me, their children had no choice regarding the location of their conception or birth. Unlike me, they are having their citizenship called into question at a critical time in their lives. Fifteen years ago, I was brought up short by a 16-year old woman who, when I asked for her resident alien card, snapped back that she was a citizen and provided her passport. I apologized for my assumption and smiled explaining that my parents also carried resident alien cards, easing the tension. Since then, my assumption has changed. The truth is that both of us knew that no one ever assumed I wasn't a citizen. I have registered to vote in four different states and no one has ever asked for proof of citizenship, even though as a child of immigrants I bear a touch of an accent. And when I was a youngster, no one ever told me I wasn't welcome in this country because my parents were aliens. Children of immigrants from non-English speaking countries encounter a special challenge. They often have to serve as translators and intermediaries for their parents. This is true whether their parents come from the Ukraine, Poland, Japan, Vietnam, Sierra Leone, Iran or Mexico. They are a fragile bridge between their parents and everyday life, between two spheres of authority. They translate contracts, fill in forms and roll with the patronizing English-speaking adults. They should earn our praise and support, a kind word, not our petty slurs. One of Francois Truffaut's later films, Small Change, deals with the travails of children in society. He deftly and humorously examines the callous way we treat children and the affronts they suffer at the hands of adults. The fact that our political discourse has dipped back into the wallow of "anchor babies" is very dispiriting, and underscores Truffaut's point that we crap on children all too often and all too easily. * Definition provided by my friend John Kanelis, editorial writer at High Plains Blogger. 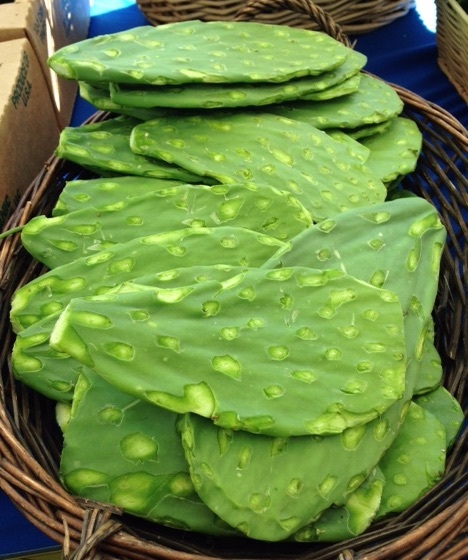 The other day I was at the farmers' market and was delighted to see a vendor displaying a basket of cactus paddles, called "nopales." Terrific in salsas and stews, they also go well with eggs and in salads. 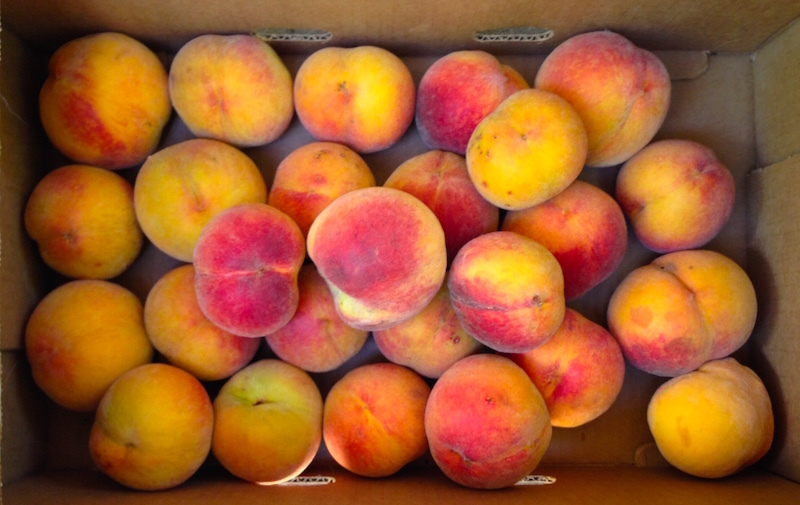 The following essay by Jodi Monroy, Director of Mixta Words and staffer at the Beaverton Farmers Market, is reprinted from the most recent market newsletter. Nopales (cactus paddles) are a staple food in parts of arid Mexico but not so much here in the Pacific Northwest, so we were amazed to find some at Denison Farms last week! We love it when our farmers are innovative and push the agricultural limits. It makes the culinary possibilities so exciting. And the very best part: Denison Farms sells them already de-spined! Trust me, that is a really good thing. Nopales are traditionally used in Ensalada de Nopales (Cactus Salad) and then eaten as a side dish or pico de gallo-style. Ensalada de Nopales makes a unique topping for tacos or mixed with eggs for breakfast. Nopales' flavor has been described as almost like a green bean. Don’t be put off by the slippery texture or “baba” en español (like Okra)—it will dissipate as the nopales cook. Classic recipes for Ensalada de Nopales almost always include lots of garlic and cilantro, like this one adapted from La Cocina De Leslie. There are two ways to cook cactus paddles for Ensalada de Nopales. The traditional way of cooking nopales is to boil the cactus in water to cover in a medium saucepan with cilantro sprigs, garlic and a couple of pinches of salt for about 30 minutes. When done, fish out the cilantro sprigs and garlic and discard. Using a strainer, let the nopales sit until all of the liquid drains away. 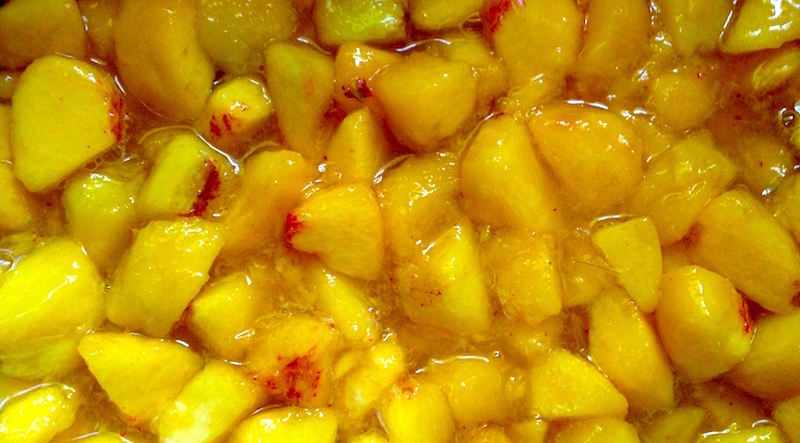 The second method is one which reduces the amount of “baba” (gooey liquid) that the nopales release. Put the sliced or chopped cactus paddles in a non-stick skillet with the cilantro sprigs, garlic and a couple pinches of salt, without any water at all. Cover and cook over low heat. 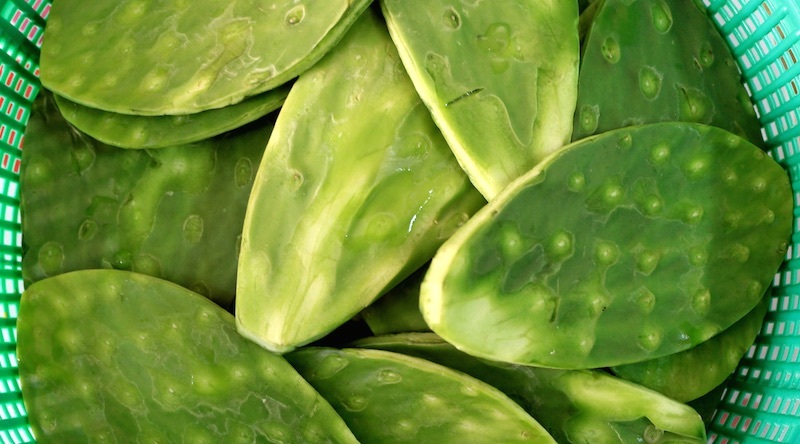 Within minutes the nopales will start to release their own liquid, which is plenty to completely cook the nopales. Continue to simmer over low heat, stirring occasionally, until all of the liquid has been absorbed and the nopales are completely cooked with very little to no “baba” (gooey liquid). Discard the cilantro sprigs and garlic. And now for the ensalada: gently mix together the cactus, chopped onion, tomato and the chopped portion of the cilantro. Toss with vegetable oil and lime juice and season lightly with salt. ¡Provecho! Top photo by Diógenes el Pacífico/Flickr. I'm always torn at the height of harvest season, the excitement of the bounty of summer bumping up against the knowledge that the season will soon slide into fall and winter. But enjoy it I will, to the very last drop. Especially as I begin to squirrel away the best of it in my little freezer, the better to pull it out on the dreariest of days to remind me that summer will come again. When the leaves display their autumn color, the bright yellows, oranges and reds appear because the green chlorophyll has been disassembled by the tree, and the other pigments in the leaf that have been there all along become apparent to the eye. This week there is a distinct shift in the flavor of the berries as the pectins and various flavor components in the fruit drop, and some of the more subtle flavors that were lost among the stronger elements are now out in front, the Chester's version of "So Long, Farewell," or Hayden's "Farewell" Symphony, if you prefer the image of the performance ending on muted notes of the violin. Since the adoption of the National Organic Program in 2002, the USDA has provided a cost-share program for farms going through the certification process. Among its strongest champions are our own Representatives Earl Blumenauer and Peter Defazio. We have been certified organic since 1999, back when it was fine to call a farm "organic" without any meaningful standards or inspections. Certification is never a cakewalk, and demands careful record-keeping and documentation of the farm's management. At times the details can be frustrating but never formidable; certification has made us better farmers. And, we will add as growers who bridged the two eras, the adoption of the national program has improved the quality of certification. In our case, the cost difference between "almost certified" and certified is $275.75. The actual cost will vary from farm to farm, but it is a modest expense relative to other farm costs, not a crippling burden of thousands or tens of thousands as some farmers intimate. Gives Anthony an excuse to keep his flip phone and 56K modem so we have enough brass to cover that fearsome certification bill. Another favorite excuse is that "you can't grow this or that crop organically." Is that so? Then Ayers Creek must be an ongoing failure as a farm because there are few crops we haven't grown over the years, all organically. We shun or drop crops because they don't work out with our current staffing, they don't make money or in rare cases we find them simply boring—blueberries fit that category, not because they can't be grown organically. The first is the most common reason because, as Zenón and Abel will tell you, we are way over-extended and it is only due to their superhuman efforts that Ayers Creek doesn't collapse into a pile of rotten produce due to our vernal exuberance. The "Astianas" started ripening a couple of weeks ago. You missed them at the market because they never arrived. We ate all of them, savoring every single one; farmer's privilege. 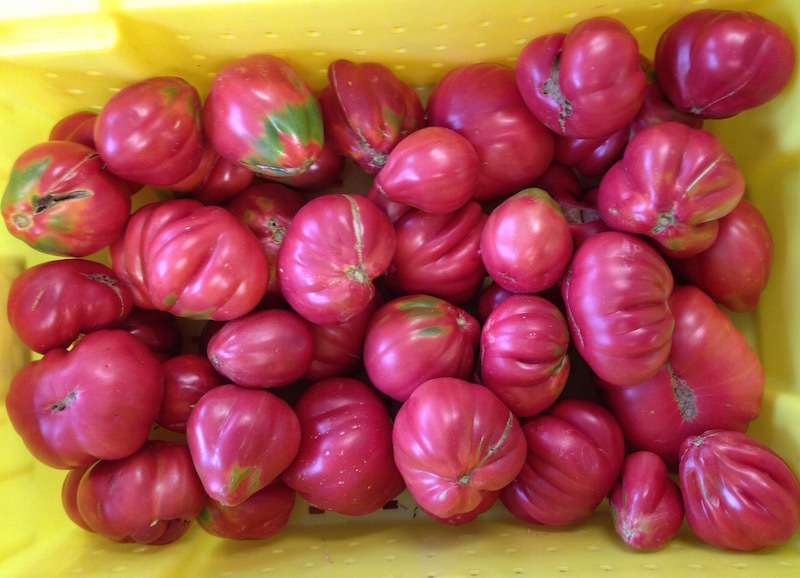 It is such a lovely fruit, an everyday workhorse of a culinary tomato, and we never weary of it. We will have a few crates full this week. Enjoy these first fruits fresh, in the grasshopper's moment, sliced and fried for breakfast or in a fresh sauce with basil, fresh onion and garlic over some sort of pasta. As in the past, next week we will have the 20# bulk boxes for sale, and then you can kick in that Aesop's ant side of the brain and put them in jars. They will come in over the next three to four weeks. We will also bring in the field run tomatillos. "Field run" is a trade term and means they are not graded according to size, color, etc. Pretty much everything we sell is field run. 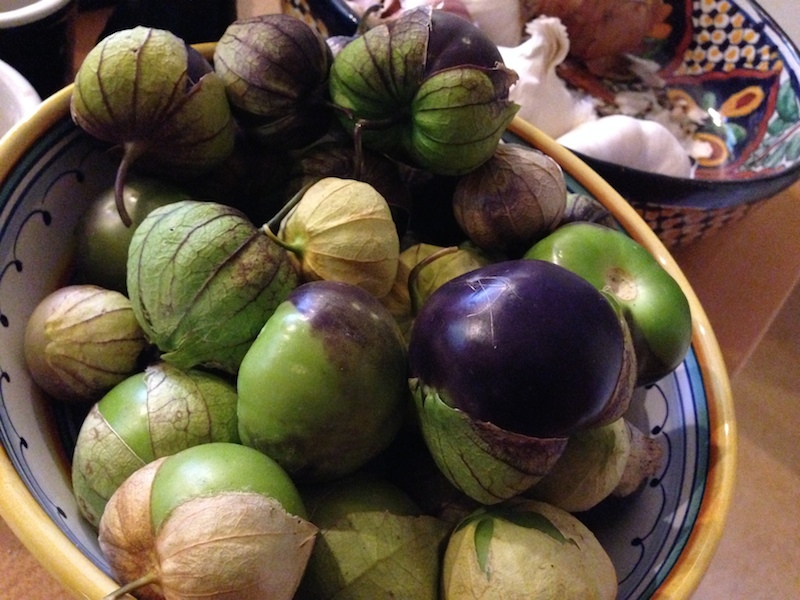 For the tomatillos, we selected out a diverse group of fruits for seed production, so it a good mix of types. Both tomatoes and tomatillos should be stored on the kitchen counter where there is good airflow. The tomatoes continue to ripen off the plant and, especially in Oregon, a few days on the counter finishes the flavor nicely. Our nights are a tad cool for tomatoes, especially in rural areas where the radiational cooling is stronger, and there is no concrete to store the day's warmth. We have had tomatillos last until March sitting in a colander. Peppers are better left on the counter as well. It's the annual curse of having all that gorgeous fruit and those fresh-from-the-garden (or farmers' market) vegetables, not to mention that all-too-tempting bucket of compost: fruit flies. It doesn't matter that a fruit fly has just as many genes as we do and that we share nearly 60% of the same genes, not to mention a susceptability to diseases like cancer. I don't want them wandering around my kitchen. The cure for this seasonal fruit fly infestation is a simple one. Rather than flinging my hands around trying to swat them out of the air, I simply pour a little cider vinegar, about a quarter-inch or so, into a bowl, then tightly cover the bowl with plastic wrap and punch a few holes in it with something sharp, like a pen. Just today, within an hour, I had more than two dozen of the %&#@!s drowning in that cider, and I couldn't be more pleased. Take that, little cousins! * Stolen from The Wonderful Fruit Fly. 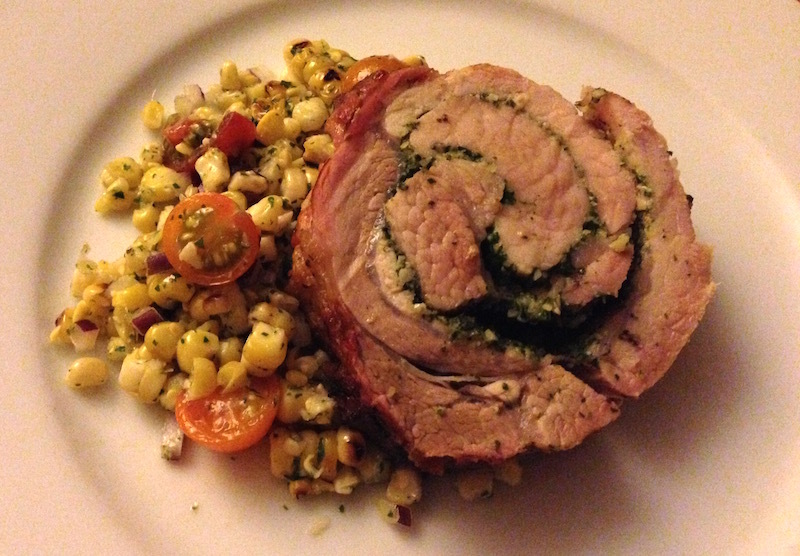 I share contributor Jim Dixon's recipes here for a couple of reasons, one being he's a really fine writer, but the other is that his (literally) down-to-earth approach to cooking with the best of the season's bounty is simple, unfussy and always delicious. 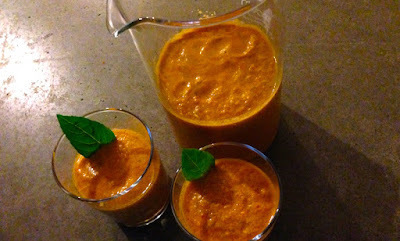 This week, one of my all-time tomato season faves, gazpacho. 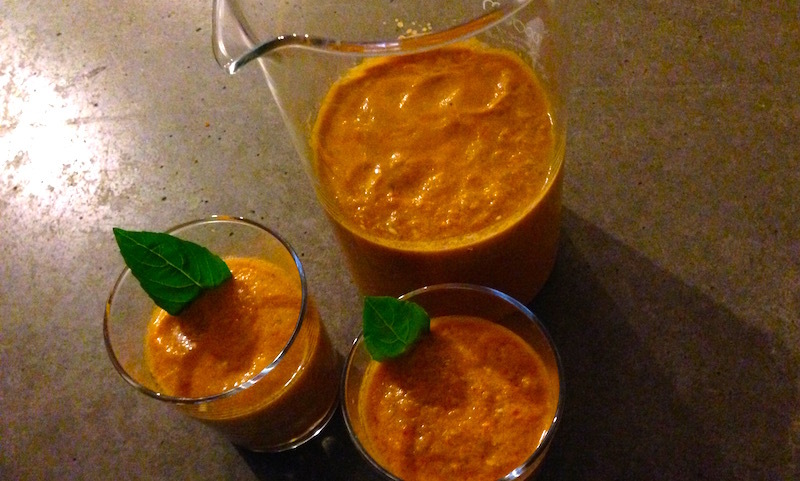 Julia Moskin's article about the gazpacho of Seville appeared in the New York Times on July 28 when the temperature here in Portland was bumping up to triple digits. I probably wasn't the only one who connected a tall glass of cold tomato goodness with the overloaded plants in my backyard. 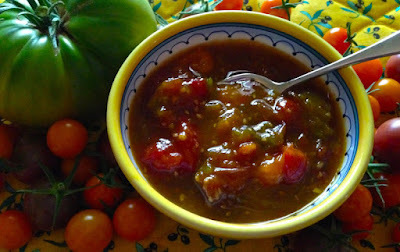 I've made her Seville-style gazpacho a couple of times since, and it's not just great a good way to use up an abundant harvest; it's delicious. Drink it on its own or serve a piece of grilled fish in a pool of the creamy gazpacho. Follow her recipe if you like, or just wing it. This much will make a full blender: 5 to 6 medium tomatoes, 1 small cucumber (peeled if one with a thick, waxy peel), 1 Anaheim or similar green pepper (not a green bell), half a medium onion, 2 cloves garlic. Cut into rough chunks, put the tomatoes in first (they'll liquify quickly and pull in the the other stuff), add a shot of good vinegar (Katz apple cider, sparkling wine, or red wine), a few pinches of sea salt, and blitz until very smooth. Then add a lot (1/2 cup at least) of extra virgin while the motor is running. Chill or serve with ice, and add a little water if it's too thick to drink easily. Moskin calls for straining out any solids, but don't bother. You want all that fiber, and it's just another thing to clean. And while a blender works best, your food processor can do the job. But do serve it in a glass. Everyone who knows me knows that I love my freezer. Small but mighty, our little upright can hold the butchered meat from a half pig and a whole lamb, a five-gallon bucket of blackberries, a dozen jars of freezer jam and the zip-locked bags (and bags and bags…) of roasted tomatoes that will see us through the winter. The tomatoes that I thaw for sauces and braising this winter will conjure memories of the heat of summer, when I stood in the kitchen, knife in hand, chopping the big, heart-shaped astiana tomatoes into chunks to roast over a smoky fire. The berries, baked into cobblers and crisps on cold, rainy nights, will remind me of the taste of those same berries, popped fresh from the canes into my mouth, bursting with warm juice. But, delicious as they are, they're still just stand-ins for the genuine articles that are flooding into local farmers' markets even as you read this. (Seriously, there are 60 farmers' markets in the metro area going on seven days a week during harvest season!) So I can only encourage you to go out and stuff yourself with tomatoes, corn, tomatillos, berries and melons to cement their height-of-the-season flavor in your mind, the better to reminisce over their flavors this winter, and look forward to their coming again next summer. In large salad bowl, combine all salad ingredients and toss. The salad will be better if allowed to stand at room temperature for an hour or so to allow the flavors to combine, so it's great to make ahead if you're grilling steaks or meats…just grill the corn first and make the salad. 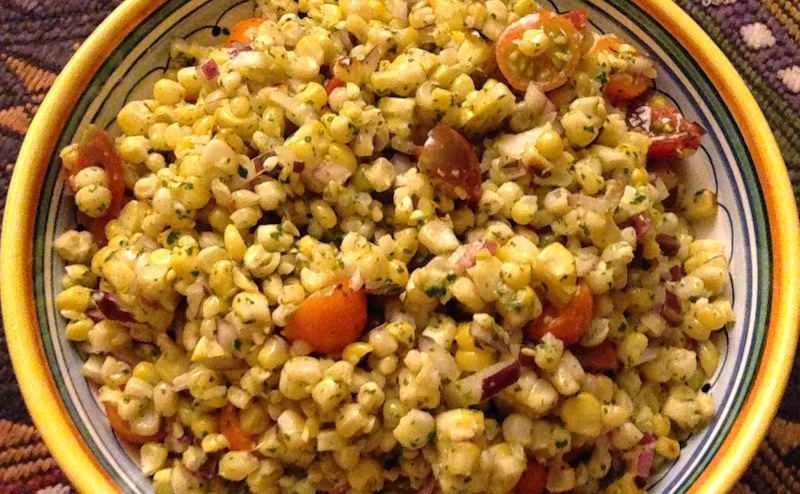 Find more corn and tomato salad recipes, one from Jim Dixon and one from Mark Bittman. I've published more than 120 of Anthony Boutard's essays on Good Stuff NW since I first ran across his writing eight years ago. His keen observations of the creatures that inhabit Ayers Creek Farm along with him and his wife, Carol, and his appreciation for the complexity of their interactions on his organic farm are deep and profound, and provide the leitmotif of the themes I attempt to address here. This one is classic Anthony. 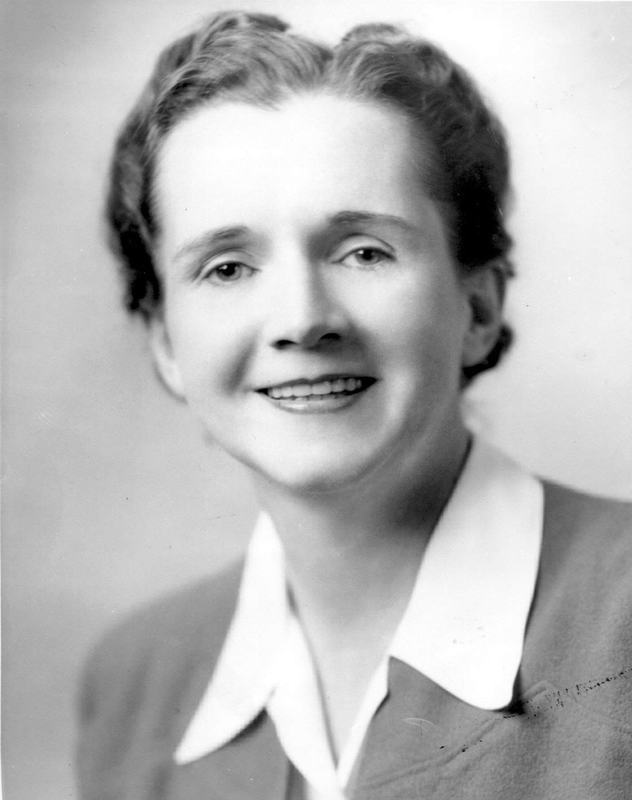 One of Rachel Carson's early articles for the American Naturalist Society was "How About Citizenship Papers for the Starling?" Loud, joyful and brash, these handsome birds are always looking for a party. Competent and improvisational songsters, but most of all they are engaging mimics. If a siren goes off at the firehouse, they will spend the next hour or two refining their siren call until, that is, a rooster crows, and then they are on that project. A tom quail calls, and an echo erupts from every idle starling. Around noontime, they descend on the bird bath in a group, splashing about until barely a drop remains, leaving a few flower petals and leaves afloat in the puddle. For some reason, they feel compelled to decorate their bath, as well as their nest, with pretty bits and fragrant herbs. Of course, when they bathe the noisy creatures squawk just like children enjoying a summer pool, then fly off as a group for some other diversion or entertainment. Back in 1939, Carson was urging us to drop our animus for the bird and appreciate its pluck and value. 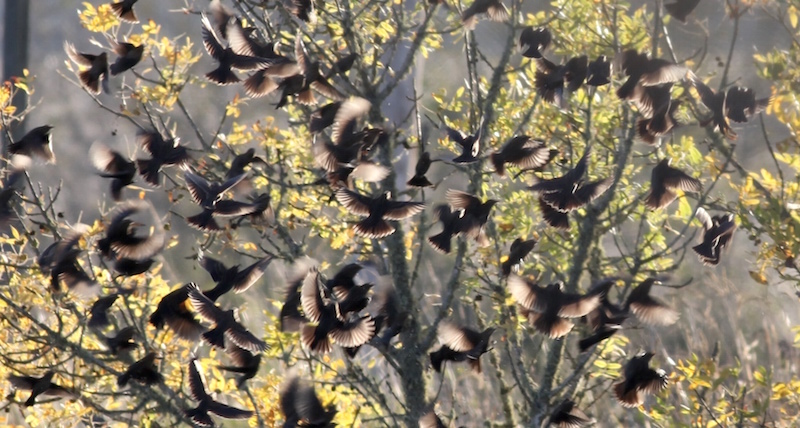 Nothing has changed, starlings still bear the double burden of being an immigrant, and flying while black. In farming areas, the starling and the crow can be shot at will, any time of the year. 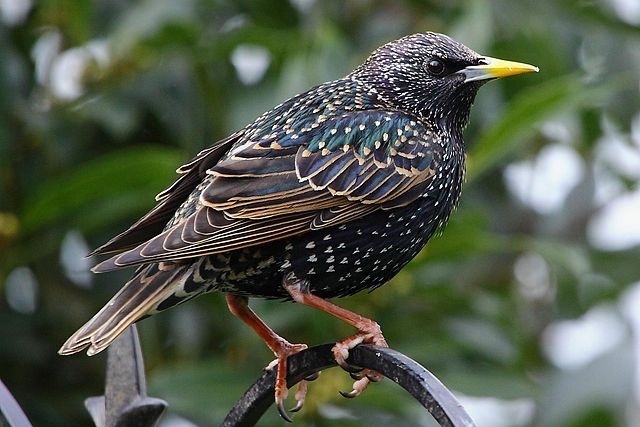 Going back a half century, the starling was accused of spreading a lung disease, histoplasmosis, threatening an as yet unrealized public health crisis. Shortly after the E. coli and spinach episode in 2006, scientists at Ohio State Extension raised the public health banner against the starling once more, along with a cool million, to see if the bird causes food safety problems by spreading the diseases from feedlots. Apparently, they convinced enough people of the problem, and received another $2.3 million. For what it's worth, starlings are attracted to feedlots because they are primarily insectivores, and insects are provided there in abundance. Our filthy food production habit is their treasure. Interestingly, the one case we recall where a flock of birds was implicated in an E. coli outbreak happened in English pea field in Alaska, and migrating Sand Hill Cranes were named as the culprit. But they are not reviled like the starling, so no snarling about a public health crisis due to cranes. The real problem was that the peas were machine harvested and no one checked the field beforehand. Machines do not not share our visceral reaction to animal feces, they plod along happily consuming the crop. Our displacement of humans with machines in the harvest of fruits and vegetables warrants more attention. The common starling (Sturnus vulgaris). In an odd way starlings and other wild creatures received good news this week. 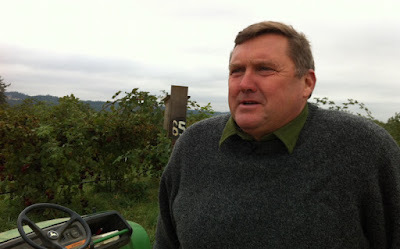 Following the 2006 spinach problem and other similar incidents, including strawberries and hazelnuts from Oregon, food safety wonks advised farmers that they should create lifeless zones around their farms to eliminate the possibility of wildlife bringing in E.coli, Salmonella and other food pathogens as a field contaminant. Remove trees and brush so birds can't roost or nest nearby, and animals can't hide. The mantra was that more scorched earth around the fields, the better, for nature is a devious enemy that never sleeps. In brief, it ended up that the research found no corresponding decrease in disease causing strains of Salmonella and E. coli associated with these measures. In fact, in some cases, an increase was detected. Diverse landscapes provide many advantages, and food safety may be one of them, but never overstated. There are many birds that eat farmers' fruits, but it is the epicurean delight starlings take in finding a good patch of cherries or berries that farmers find particularly galling. The merry cacophony rubs their nerves the wrong way. But farmers are always stingy with credit. When we cultivate the soil, an army of starlings waddles behind the tractor gleaning every wireworm and cutworm available, sometimes carrying eight or ten grubs in their long yellow bills. They fly back to their nest, and return seemingly just moments later. If we are not exposing grubs for them, they are working the berry fields and orchard, again carrying back full bills of food. Watch their nest holes, and you will see them flying back and forth from sunup to dusk. Although they eat some fruit, insects and larvae are the staple of their diet. The starlings are cavity nesters, and another one of the dire predictions made 50 years ago, repeated with the alacrity of a starling's mimicry, is the usurpation of other cavity nesters by these aliens. In our observations, flickers, starlings and kestrels share similar sized cavities, and they alternate sites from year to year. Swallows, chickadees, bluebirds and nuthatches use much smaller cavities than the starling. All of these cavity nesters have healthy populations in spite of this dastardly usurper. In fact, the alternation of nest sites may provide a valuable health function for the three larger birds. They belong to three different avian orders, and consequently host different parasites, mites and insects. The birds are probably following a similar practice to farmers who rotate crops from different plant families to reduce disease and insect problems. Finally, one more endearing trait of the starling. Remember the petals and leaves in the birdbath? It is part of their courtship ritual. The male starling finds a suitable cavity and builds a nest of fine grass decorated with petals and fragrant leaves. Very much like the bower bird, his female suitors visit and decide whether he is of the salt. When a female accepts the proposition, they finish the nest together, do some other stuff and she lays her eggs. Top photo of starlings and other birds by Anthony Boutard. Photos of the starling and Rachel Carson from Wikipedia. At $6.99 per pound, it's not a steal, but for some fine eating for a decent price, pork loin is a good place to start, and they're often on sale at our supermarket butcher counters. We usually cook it on the grill, searing it directly over the coals then moving it to the side so it can achieve maximum succulence. Slice roast lengthwise through the middle, but not all the way through. One way to assure juiciness in what can often be a rather dry cut of pork is to stuff it with something savory, whether a mixture of greens and herbs—a garlic pesto or kale stuffing would be awesome—or, what I've been doing lately, a variation on Dario Cecchini's treatment with garlic, fennel pollen, salt and rosemary. Open like a book, then slice horizontally through the left side. Prepping the roast for the stuffing process is extremely easy. The simplest method is to snip off the twine binding the roast, turn it so the short end is toward you, then slice it halfway through the long way, stopping before you slice all the way through. Open the roast like a book, slather it with your stuffing, then roll it up starting at the right-hand end. 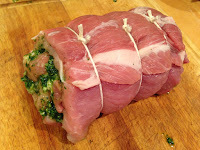 Using some butcher's twine (available at most markets), tie the roast in three or four places. Repeat with right side, open flaps and spread with stuffing. The other method is a little harder but gives a much more satisfying result. Slice and open the roast as above, then make a shallow slice down the center, again stopping before you go all the way through the roast. 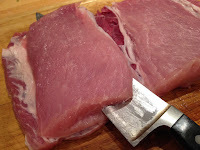 Then make a horizontal slice to the left from the center cut to the end, stopping before slicing it through. Repeat going from the center to the right side. Open these two flaps and you'll end up with a long slab of meat that you can slather with stuffing and roll up from one end to the other. 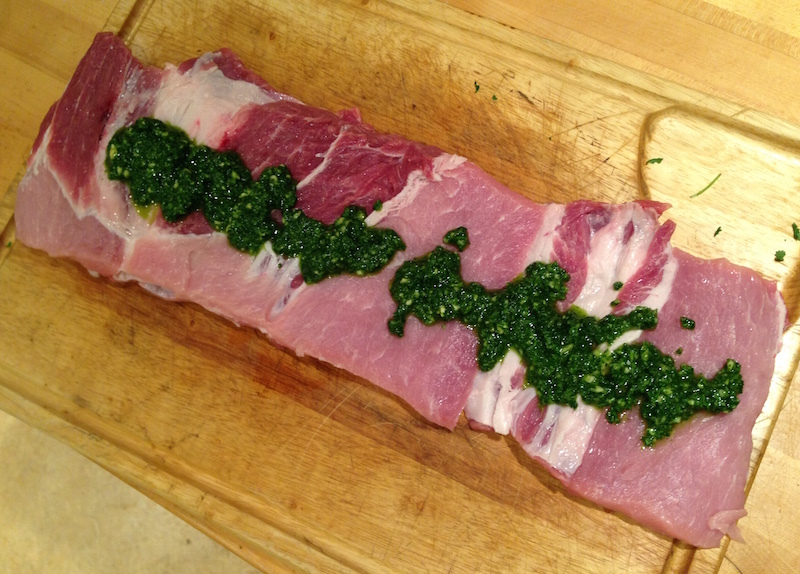 Roll up, tie and roast…easy! Grilling takes close to an hour, and roasting it in the oven at 400° will take about the same amount of time. If you don't mind heating up your house by turning on the oven—I'm writing this in the middle of a very warm NW summer—a really great thing to do, which gives you an instant side dish, is to roast the meat on top of root vegetables, as in this recipe. I usually aim for an internal temperature of 125° to 130°, then remove it from the grill or the oven, cover it with aluminum foil and let it rest for fifteen to twenty minutes before slicing. Here are some stuffings to try: Kale and Pine Nuts, Nettle Pesto. The stuffing pictured above is a cilantro pesto. Try it with green garlic, carrot top pesto, or a flavorful combination of greens and herbs. For years I'd been battling the red-stemmed, succulent-like weed with the fat, oval leaves, wondering what in the heck kind of invader it was. It wasn't particularly hard to pull out, but it was pretty darn persistent, coming back every year like those door-to-door fundraising dudes with their clipboards. I'd seen it in other people's yards, too, even growing out of the most inhospitable cracks in the sidewalk. 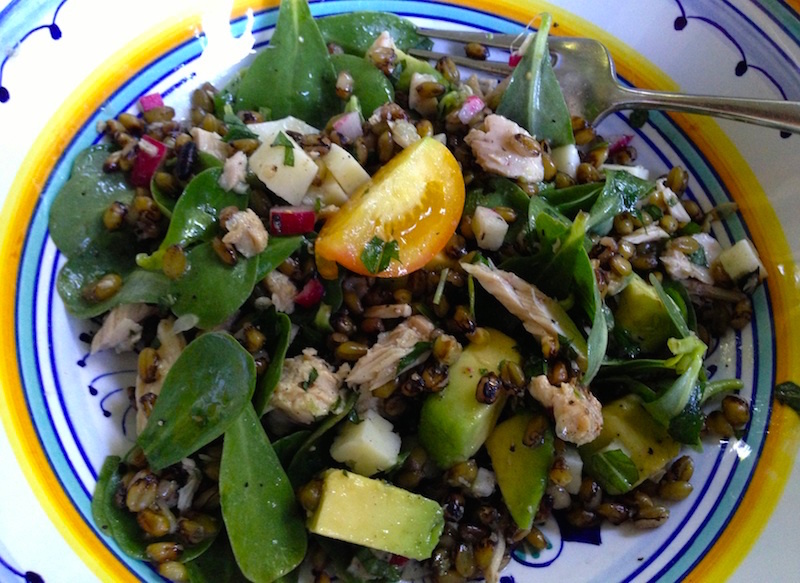 Purslane in a grain salad. Then, out at Ayers Creek Farm one day, I saw its familiar shape and made some kind of smart remark to Anthony Boutard about needing to do a better job weeding his rows. First, never mention weeds to an organic farmer…the plant you're pointing at might be a valuable nitrogen-fixing cover crop for soil improvement or be providing shade for a sprout that's just peeking out of the soil. 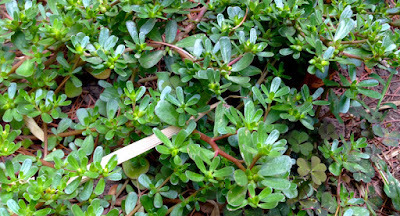 He informed me that the "weed" I was disparaging was purslane, one of the bonus crops he sells at the farmers' market, along with other field greens like chickweed, lamb's quarters and more. Crunchy when fresh, with a mild, lemony flavor, it's most often used in salads, either as the main ingredient or combined with other greens and grains—try this terrific main dish recipe for tuna, grain and purslane salad. 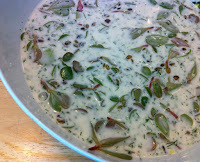 My friend Linda Colwell follows Deborah Madison's lead and includes it in a buttermilk and frikeh soup. Anthony likes to do a quick and easy pickled purslane (recipe below) that keeps in the fridge and can be featured on an antipasto platter or as an accompaniment to grilled meats. Incredibly high in omega-3 fatty acids—more than any other vegetable—it's also a great source of beta-Carotene, with five times the vitamin E of spinach, according to an article by my friend Leslie Kelly. No wonder it's starting to get some buzz as the new Superfood. Our staff keeps a nice kitchen garden outside of their front doors. For them, the plants they call verdolagas are an essential green. They are delicious boiled, sautéed, pickled or as a salad. The Lebanese serve them with yoghurt. The French salt purslane overnight before adding it to a salad. Boiled, it can be dressed with a bit of olive oil and ground pepper. 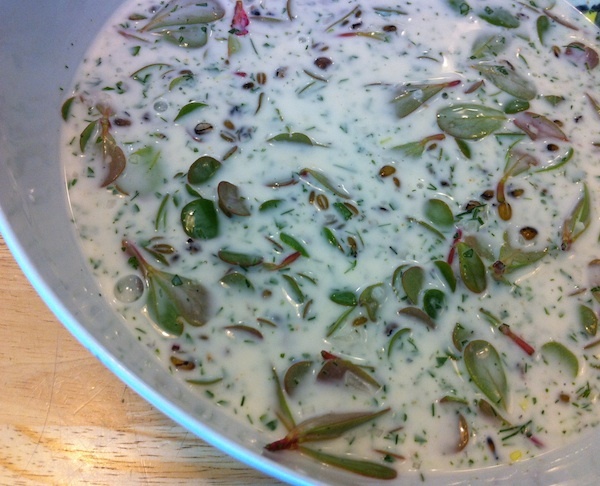 Or mix the wilted leaves into a potato salad. We heat and add a tablespoon of salt to 1-1/2 cups of water, then mix in an equal amount of white wine vinegar. Add a few cloves of garlic, quartered, a tablespoon of peppercorns and a dried pepper. Drop the purslane into the heated vinegar mixture and let it wilt for a bit. Pack the purslane and vinegar mix in a mason jar. If you need to, top off with vinegar and water in equal proportions. Store in the refrigerator. We start using them about an hour later, but they will keep for several months. Some recipes call for full strength vinegar, but we much prefer it diluted. The human brain has a deep affinity for names. Soon we will start harvesting the nameless grape which we call a "grape with no name," what a surprise. A nod to both a song and a restaurant from decades past located on Commonwealth Pier in Boston. Run and staffed by descendants and family of Portuguese fishermen, the restaurant had no name, no sign and no menu. Enter the only blue doorway on the pier, and when it is your turn in the line, look for an opening among the long tables covered with checked oil cloth. Two choices for lunch, the day's seafood chowder and the day's fried seafood. It was the toughest choice ever put before us. 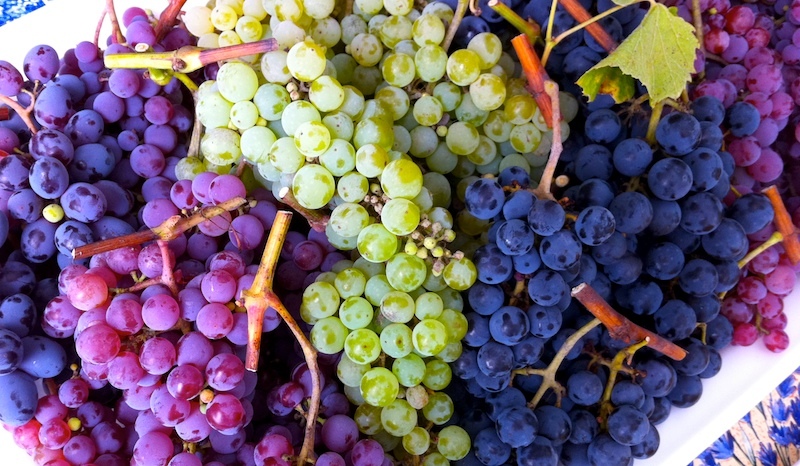 Our nameless grapes (green grapes in top photo, center), so named, elicit opposite reactions. At Higgins, Greg and Patrick gamely put it on the menu as a "grape with no name" whereas Josh and his staff at Food Front display them as "Boutard grapes." Despite our entreaties that food should be defined by how it falls on the palate, Josh told us a nameless grape is just too much for people to swallow. 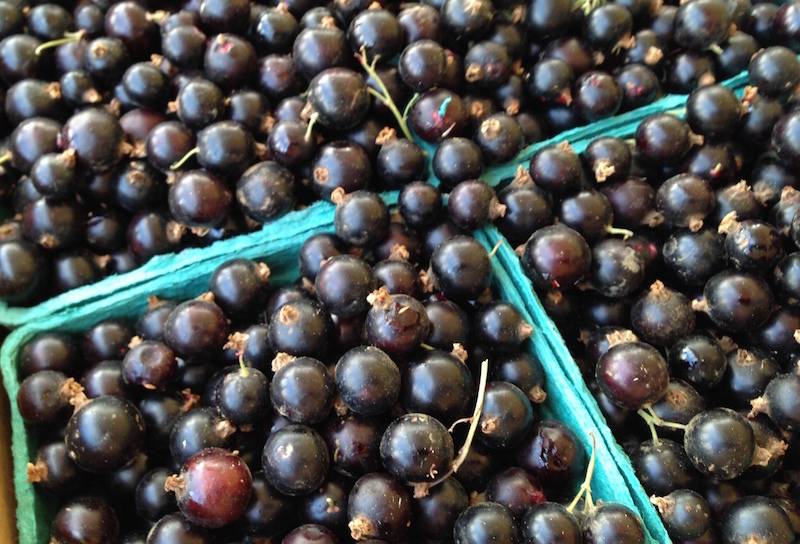 Heidi's son, Jack, calls them Anthony grapes. We will leave them nameless, but we appreciate the dedications. Under certified organic agriculture, synthetic nutrient sources with their acidifying behavior, as well as synthetic disease and pest controls, are prohibited. Indigestion solved? Not if you consider pH alone. On occasion we have had our soil tested, and the test results always included the pH as a perfunctory service. The results are all over the map, from 4.9 to about 7.1. It is a labile character of the soil, shifting with the seasons and crops, and its measurement is generally not particularly informative. In an organically managed soil, the bacteria, fungi, microfauna and the crops themselves all influence pH. So our soil might be acidic enough to warrant adjusting in a synthetic regime, but not under organic management. But what about the calcium? Don't we need to add lime anyway, and the pH will tell us how much is safe to add because excess lime can damage the soil and inhibit plant growth? There are six elements plants need in substantial quantities: nitrogen, phosphorus, potassium, sodium, calcium and sulphur. We have to amend our soils to maintain sufficient levels of these elements; this is especially important on a commercial farm where we are hauling into market substantial quantities of these elements in the form of food. On an organic farm, calcium and sulphur are especially important because they are the building blocks for the plant's defenses against diseases and insects. Calcium is a key element for cell wall strength—most of the plant's calcium actually resides in its cell walls—and sulphur is a building block for the crop's internal chemical defenses. On a farm where the crops have external chemical defenses against disease and insects, that is, synthetic fungicides and insecticides applied by the farmer, the cultivator need only provide just enough calcium and sulphur for basic biological functions. Organic farms have spiders, dragonflies and a host of other predaceous arthropods helping to control the insect populations, as well as beneficial bacteria, yeast and fungi that ward off disease, but we need strong plants as well. 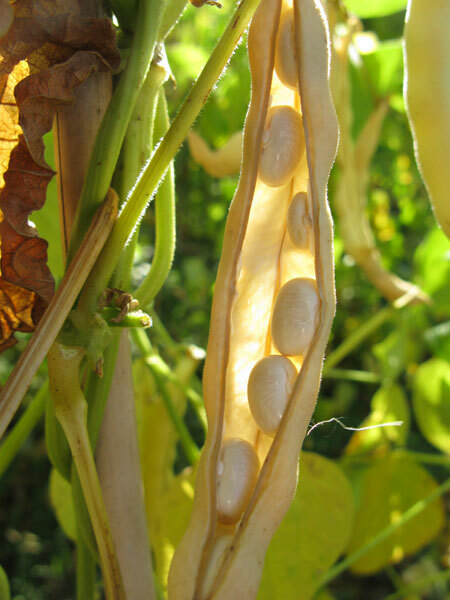 Consequently, crops grown under organic management need more calcium and sulphur available in the soil, in fact nearing an excess under conventional nutrient interpretations. As mentioned above, agricultural lime, calcium carbonate (CaCO3), is problematic as a calcium source. It can damage the soil's structure and chemistry. Although it is cheap, a 50# bag of lime costs about $4.15, it is not the best deal. Another good source is gypsum, but it does cost about 50% more, at $6.05 for a 50# bag. Even though it is nominally more expensive, we use gypsum exclusively, and never use lime. Generous applications of gypsum do not harm the soil, in fact the mineral improves the soil's texture, nor does it change the pH significantly. This is important because many fungi and bacteria thrive in certain pH levels, and changing the pH suddenly and significantly without a very good reason can alter the microbial ecology of the soil unproductively. Gypsum is calcium sulphate (CaSO4). The best reason for using gypsum from the perspective of an organic grower is that you get both important elements, calcium and sulfur, and pay just 50% more. A very good a deal, especially when you factor in the costs of transportation and spreading the amendment. The other problem with lime is that the carbonate anion is at best valueless, possibly harmful, absent terrestrial indigestion; plants fix their own carbon from the air through photosynthesis so it is completely non-nutritive. We use gypsum for all our crops, annual and perennial, and buy more of it than any other amendment. A cautionary note on gypsum sources. It is best to avoid recycled gypsum because some older wallboard contained trace amounts of mercury as an anti-fungal agent, or fungicides. The Organic Materials Review Institute (OMRI) tests and certifies materials used in organic agriculture. On bags of gypsum and other amendments, it is best to look for the statement "OMRI Approved" or "OMRI Listed." We also use a small bucketful of gypsum to mark yellow jacket nests so no one walks into them. We toss it over the hole and they dig their way out unharmed. They are valuable predators and scavengers, worth keeping so long as we know where they are. Too often, organic agriculture is characterized in the negative, especially the absence of synthetic pesticides. Once you settle in as an organic farmer, success comes with managing the soil ecology so that you build strong crops that coexist with the benefits and the challenges that nature delivers. Book 18 of Pliny's Natural History is his discussion of farming. The book opens with a rambling plea regarding stewardship of the earth—he was no Homer or Sappho—but as you read it the fundamental spirit of organic agriculture is apparent. He laments the tendency of farmers to treat their fields like a battlefield, deploying poisons and other measures against nature. He urges us to farm in a manner that thanks nature for bringing us into world, and treats her as our benefactor in a shared enterprise with the full measure her creation. It is apt advice 2,000 years later. When you see a price like $5.99 per pound for albacore, our West Coast version of filet mignon, it's hard not to start drooling. But then you realize that's for a whole fish, which average 12 to 14 pounds. It's not only a little intimidating to think about what in the heck you'd do with that much fish flesh, but it can also be a drain on your bank account. But here's the thing: When you consider that albacore normally sells for twelve bucks and up per pound, buying the whole fish makes a lot of sense from the perspective of your wallet. 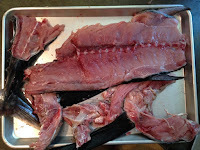 The store will filet the fish for you, removing the loins (four per fish) from the skeleton. To get even more value from your fish, ask the butcher to package the bones and scraps separately, which may have as much as a couple pounds of flesh still clinging to it. When you get the fish home, you have several choices: you can fire up the grill or the oven and roast one of those loins for dinner. The other three loins can go in the freezer for another day—they'll be good for several months if they're well-wrapped to eliminate any air getting to the fish. You can also confit one of the loins (recipe below), a quick process that will make any canned fish you've had pale by comparison. 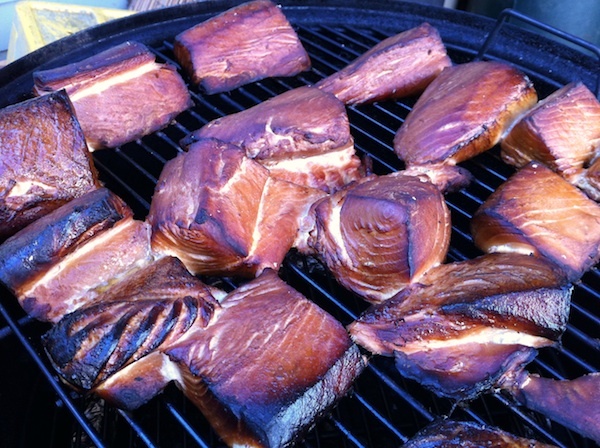 Or if you have a smoker, I can personally testify as to the deliciousness of smoked albacore, which also happens to keep quite nicely in the freezer. That skeleton can be tossed in a big pot of water and simmered for an hour or so, giving you quarts of amazing fish stock (again, keeps for months in the freezer). Or you can put the carcass in a roasting pan at 400° for a half hour or so till the meat is cooked through, then cool it slightly until you can pull the meat off the bones. This results in a surprising amount of fantastic tuna that you can use in salads, sandwiches, a tuna "schmear" or dip—go crazy, there'll be lots! 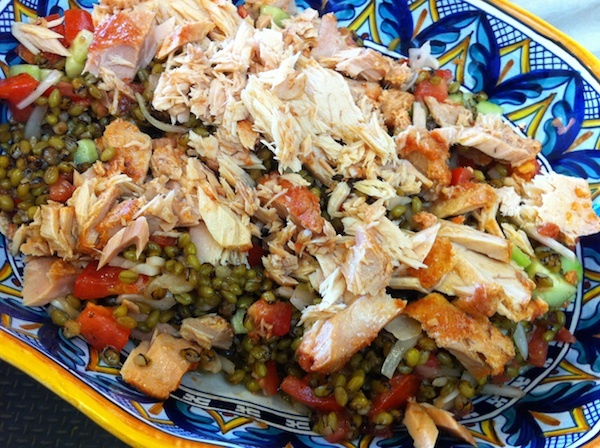 Albacore, grain and vegetable salad. 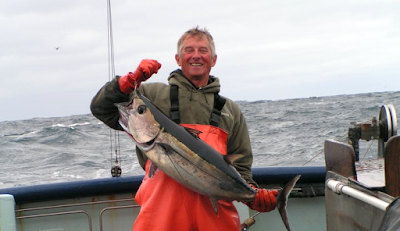 To gild the lily, not that it needs it, West Coast albacore, because the fish are young when they're caught and haven't lived in the ocean that long, are extremely low in mercury and are perfectly safe to eat for young and old alike. They're high in omega-3 fatty acids, complete proteins, selenium and vitamin B-12, all shown to be beneficial for health. Not to mention that the fishery off our coast has gone through a rigorous certification process and has been certified as sustainable by the Marine Stewardship Council (MSC). Also know that almost all the boats in our coastal fleets are owned by individual families, so the more albacore you buy (and enjoy) the healthier and more sustainable our coastal fishing communities will be. So the next time you see that there's a big sale on whole fish, buy one for your family or to share among a group of friends. You won't be sorry! 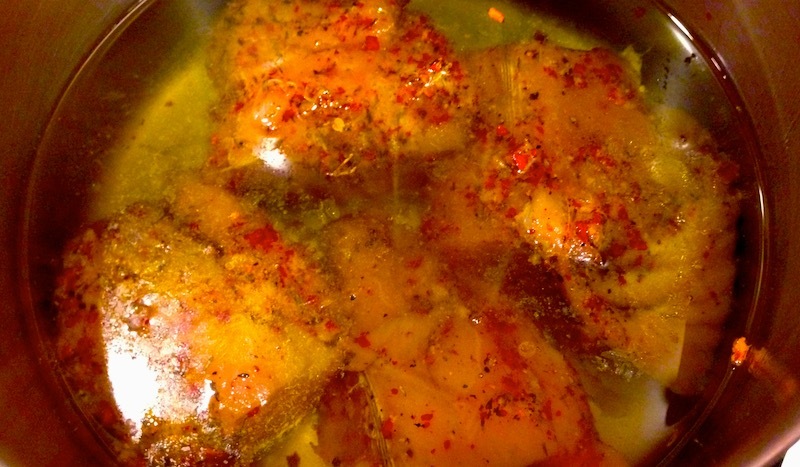 Place fish pieces in a saucepan and cover with oil. Put over very low heat and, using an instant-read thermometer, very slowly raise the temperature to between 140-150° (fast heating will cause the surface to seize and it will turn out dry rather than moist and tender). 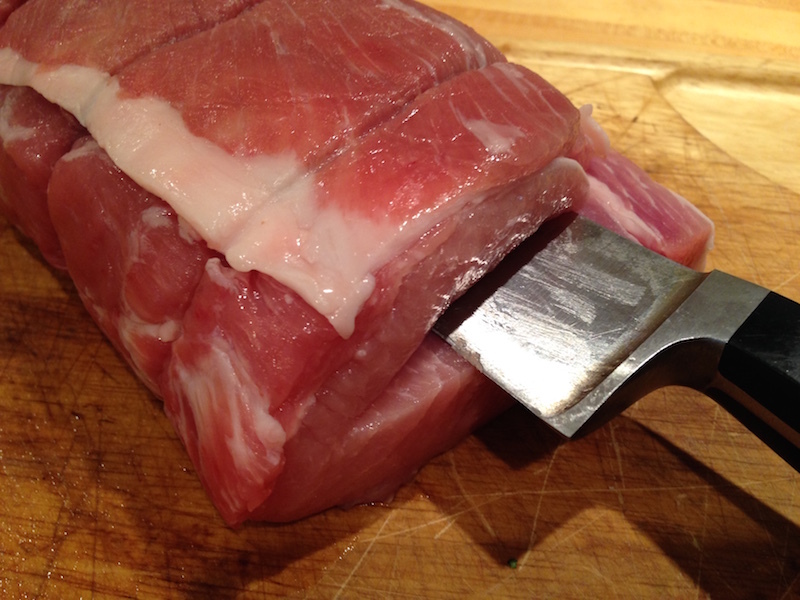 Maintain temperature for three to ten minutes, or until the center of the thickest piece is almost cooked through. (You can use a fork or knife for this purpose.) Turn off heat and allow the oil to cool. Remove fish from oil. Strain remaining oil through a fine mesh sieve. For more information on Oregon albacore, read Oregon Albacore A to Z.
Contributor Jim Dixon of Real Good Food is particular about the products he carries, so when he adds a new item to his lineup, you can be sure it's been taste-tested at the Dixon household and is worthy of an appearance on his pantry shelf before he offers it to his customers. This recipe for whole wheat pasta sauced with a variation on the more familiar Genovese basil pesto sounds like the perfect solution to a light summer dinner. Along with the dritta olives that make Pollinaria's great extra virgin olive oil, the farm in the mountains of Abruzzo, Italy, also grows an heirloom variety of semolina wheat called Senatore Cappelli that's used to make whole grain (grana duro in Italian) pasta. I've never been a fan of whole wheat pastas; most I've tried have been grainy and didn't have the unique flavor of good semolina pasta. But last year I tried Pollinaria's and was surprised. It had the texture and taste of traditional Italian dried pasta. The Pollinaria pasta, made from their organic semolina wheat, is extruded through brass dies that give it the rough surface to hold sauce, and the pasta is slowly dried to allow the flavor to develop. While they make several types, production is limited and I was only able to get fettuccine this year. If you like it as much as I do, next year I'll try get penne and chitarra. I cooked a batch of the fettuccine and ate it with pesto alla Trapanese, the almond and tomato sauce served across Sicily. Briefly toast a handful (about a cup) of almonds in a skillet until just beginning to brown. Combine the almonds in a food processor with two or three coarsely chopped tomatoes, a couple of garlic cloves, a handful of basil (I also added some mint), a pinch of salt and a good drizzle of olive oil. Pulse until well-blended but not completely pureed. Add a couple of big spoonfuls to bowl of cooked pasta*, sprinkle with Parmigiano Reggiano and eat. * You can also substitute your favorite whole wheat or regular pasta for the Pollinaria. In the abundance that is harvest season, with its piles of corn, peppers, late berries and peaches, it is difficult to imagine what we're not seeing. That is, the crops that withered in the field or failed due to the vicissitudes of weather, moisture or a bad batch of seed. Those are the realities of the farmer, as contributor Anthony Boutard of Ayers Creek Farm reminds us. As the Blue Moon sets, the new day marks an old Anglican celebration, the Lammastide. On this day, the British celebrated mass at the start of the wheat harvest with loaf of bread made from the new crop. The word, in typical British fashion, is likely a corruption of "Loaf Mass," though ponderous sorts have tried to document less plausible derivations. Rooted in the rural parishes, Lammas faded from the liturgical calendar with the industrialization of the 19th century. 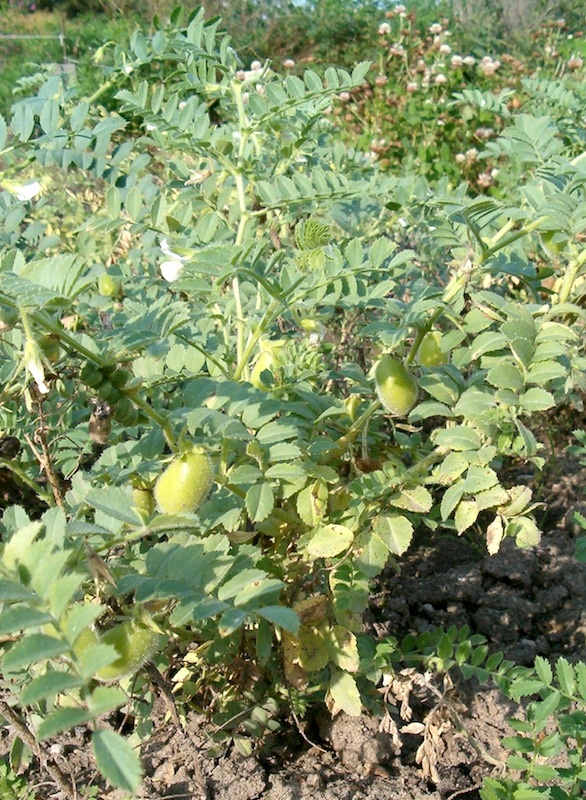 The chickpea plant (left) and chickpeas (top). We can only wish that Vaughn Williams had composed a piece to celebrate the Lammas. Digging about, we found but one hymn that had a peculiar martial bent to it. Not even worth quoting. For those of us born under the sign of Aries, it is easy to conceive of the harvest a sensuous, fertile moment, not a forced march into the fields. Indeed, in the Northeastern states, the community corn harvest brought the town's families together and was called a "frolic" where rewards were tendered with a buss, not script. Today, the word lammas is used more often by arborists, foresters and plant physiologists than the clergy. Lammas growth is the second spurt of growth following fruiting, typically around the beginning of August. This growth is tender and runs the risk of damage if it fails to harden off before the frost falls. Our kestrels and barn owls are raising what might be termed a lammas brood. A bit exasperating as both are noisy species; the kestrels all day and the owls take the night watch. This week, we harvested the chickpeas. Despite our best efforts, the harvest is about a third of what we expected. A real consequence of the dry spring and early summer. 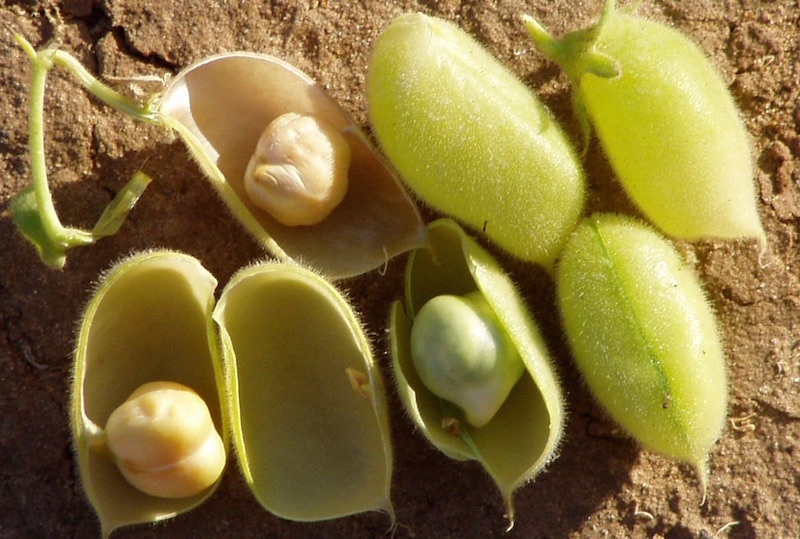 Chickpeas are a spring-planted dryland crop and a few May rains are essential for good yields. Our wheat was also on the shy side, but less so because most of its growth takes place during the winter rains. 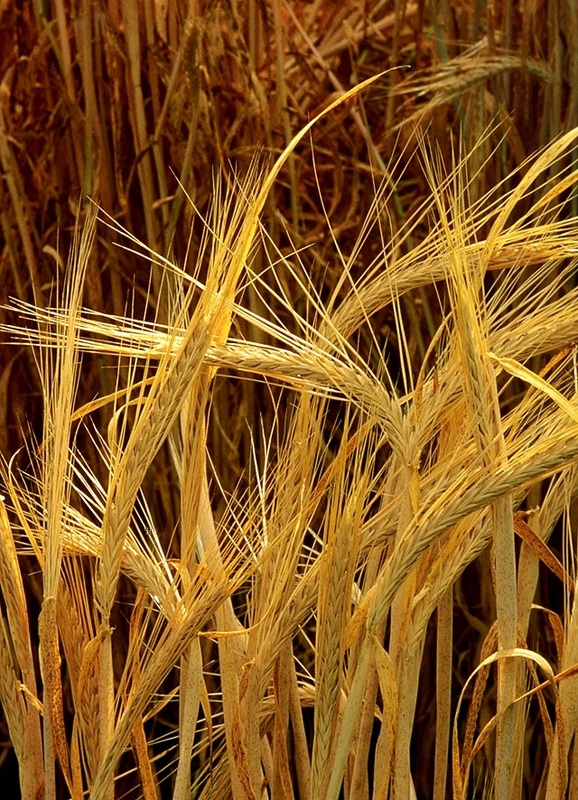 Barley, which also grows through the winter but is easily knocked down and damaged by the May rains, produced an excellent crop without that challenge. 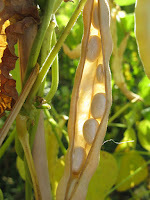 A diversity of crops means the disappointments are mingled with the successes. Keeps you humble even as the occasion may call for celebration. 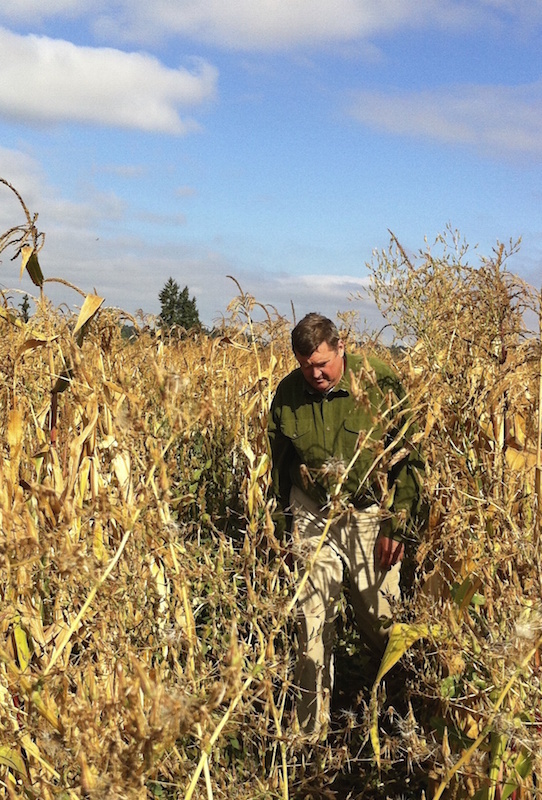 For farmers, the hardest decision is to walk away from a crop. Thursday, Zenón and Anthony took a look at the currants and gooseberries with a thought to the autumn tasks. Zenón exposed a few branches with beautiful black currants dangling from them. Smiling, he said Abel advised him not to show Antonio the fruit, lest he get an idea that it should be harvested. Irresistable. In bold red letters on the day's picking list was 20 flats of black currants, much to the momentary horror of staff. Actually, we will walk away from the fruit, it is not worth the time or distraction. Though it is never with pleasure, coming to such a decision is cause for relief. The time we might have spent messing with the currants will be better invested in managing the grapes and beans. Three years ago, as some of you may recall, we had to walk away from the grapes because of severe mildew. Rather than lament what is lost, we best revel in what providence has delivered, and this year it will be the grapes and barley, as well as corn, beans and blackberries. Photos of chickpea pods, chickpea plant and barley from Wikipedia. "Need peaches? 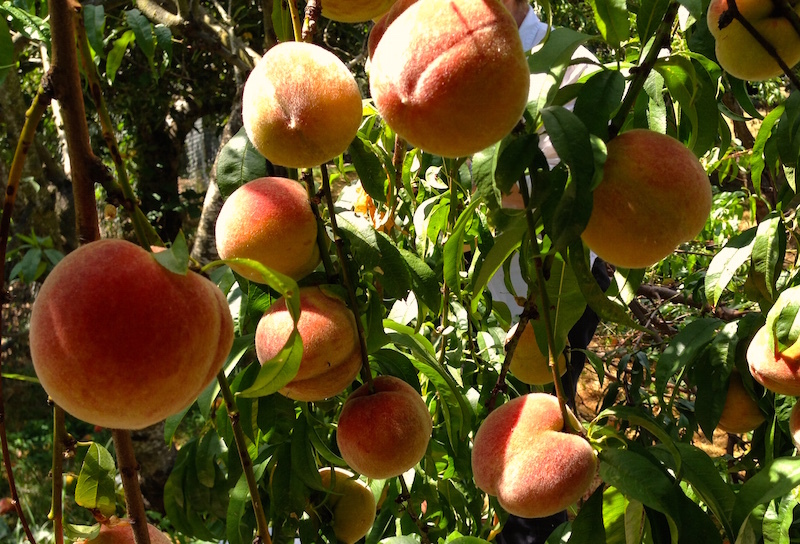 A friend invited me to come pick peaches from her three overloaded trees. I thought I'd go this afternoon. Want to come?" How could I refuse to help unburden those three trees? It verged on turning away from a lost puppy or refusing to help a poor lost soul. In other words, I was so in! With our boxes stacked in the back of Chili, we arrived at the aforementioned friend's home in the Cully neighborhood to find that, indeed, the trees were so loaded with fruit that several large branches had torn off under their weight. A few ripe peaches had fallen of their own accord and were lying in the grass gently decomposing in the warm shade, but few bees were buzzing around, making our job ever so much more pleasant. A slight press with a finger into the flesh near the stem gave a good indication of ripeness—a bit of "give" is all you're looking for—and, since there was so much that was ready, it took us only about a half hour to get twenty pounds apiece. Even better, since it was obligatory that we taste test a couple, they turned out to be not only richly sweet and juicy, but a freestone variety that peeled with a simple tug at the skin near the stem. What a treasure trove! When I got home it was incumbent upon me to make a dessert with them, and with peach cobbler near the top of my nigh-perfect dessert list, I whipped one up and stuck it in the oven. While it baked, I sliced up and froze a gallon-and-a-half or so on parchment-lined cookie sheets to be dumped into zip-lock bags for a surprise dessert in the dead of winter. The rest were made into peach jam in two batches over the next couple of days as the not-so-ripe peaches matured, more goodness to open up in the coming fall and winter, reminding me of that hot, sunny day under the peach trees with my friend. The first fruit of the season, whether berries, stone fruits, zucchinis or cucumbers, have naturally high levels of pectin, so you can make preserves without resorting to adding pectin, which some people feel changes the flavor of the fresh fruit. I like my jam a little runny and it took about 2 hrs. or so to get to that point. I also don't like excessively sweet preserves, so judge the amount of sugar based on the sweetness of the fruit and your own tastes. If the jam is too chunky for you after it cooks, take a potato masher and squish it until it's the right consistency. As far as canning, I simply take washed jars and fill them within a quarter inch of the top, put on the canning lids and rings and cool them to room temperature, then freeze them. If you have a hot water-bath canner, follow the directions for shelf-stable storage.